Few things are as important as our notions of justice and mercy. Yet how are we to make sense of our moral treatment of the poor given all the political, philosophical, and theological voices? While Christian Scripture is not silent on the matters of social justice and charity, even here our variously conditioned presuppositions cause us significant interference. Only a careful hermeneutical reset can move us beyond our personal and cultural situatedness. This requires a thorough exploration of both interpretative strategies and pertinent scriptural witnesses. So how would the New Testament witness have us treat the materially needy? How do we act justly and love mercy in walking humbly with our God? "This is easily the best discussion of the relation between social justice and mercy in the New Testament. With judiciousness and insight it considers all the relevant passages. It is theoretically and hermeneutically sophisticated, and thoroughly informed in the secondary literature. Altogether, a splendid contribution to an important and charged issue." "Justice and helping the poor is a contentious area in biblical studies . . . What is needed is a careful walk through this discussion in terms of what has been said, hermeneutics, and a close look at the texts with discernment on how the entire scope of texts works individually and together. Here is a solid study that does just that. It orients the reader to the levels of the discussion, walks through the texts, and gives categories of classification." "A true biblical theology on social justice is desperately needed. There are few topics more emphasized in Scripture, and Hron's work aptly fills this need. This is a book for the church both to study and put into practice." 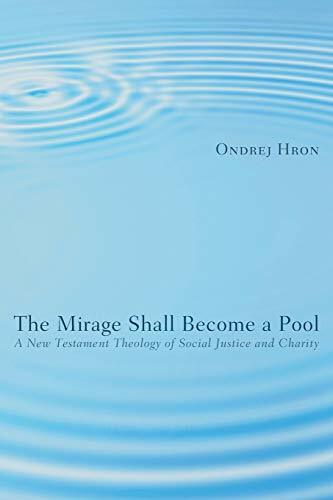 "The Mirage Shall Become a Pool is perhaps the most hermeneutically sophisticated and exegetically thorough work on the theme of social justice and poverty in the New Testament that has been written to date . . . This is a critical work for anyone interested in the biblical view of social justice and the Christian obligation to the poor." The Archives is located at 1232 N Fair Oaks Ave 10B in the Fair Oaks Business Park in Pasadena, California. We have over 50,000 volumes in stock covering a wide range of theological disciplines. We offer a broad selection of Bibles, Biblical Studies, Bible Commentaries, Theology, Philosophy, Church History, Ministry, Mission, Antiquarian and collectable. We're now in our 38th year of doing business. All Books listed at the Archives are guaranteed "Good" or better according to our scale below. All used dust jacketed books include a Brodart (protective plastic sleeve). New: A book in the same condition as when it left the publisher. Very Good: Insignificant rubbing. Dust jacket might be price clipped, owners inscription inside flyleaf.